This selection of Krenek’s chamber music and songs, the first volume in a series, opens and closes with Double fugues for piano that date from the end of the First World War. They are the earliest works in the disc and were written during Krenek’s studies with Schreker. Putatively compositional exercises these two pieces, composed when he was in his late teens, reveal something of the craggy independence of spirit that he exuded, where rigour expands to admit more astringent writing and yet honours the source material. Krenek doesn’t omit grandeur either, though whether Schreker responded positively to such gambits we aren’t told. These are apparently the first recordings of the Double Fugues. By 1929 Krenek had the opportunity to write a work for Artur Schnabel who was giving trio recitals in Berlin with Carl Flesch and Gregor Piatigorsky. He duly wrote the Trio Phantasie which he later dismissed as ‘an entirely inferior composition’, best forgotten. From this perspective it’s hard to take the composer’s side but maybe the romanticist spirit of the work, its beautiful – but beautifully clement – passivity jarred with his later more probing sensibilities. Maybe too he felt it was insufficiently virtuosic and expansive for three such outstanding artists and offered them too little breadth. Still, its filigree, charm and ardent demeanour are certainly attractive features of a work only eleven minutes in length. Just after the war he wrote a Trio for clarinet, violin and piano, an attractive work that glories in a wide variety of moods. The second of the two movements is cast in twelve-tone procedure and is full of incident. Apparently, when asked, contemporary audiences thought it was the first movement that supported the procedure. The String Trio followed soon after, another early manifestation of his personal but lyrically-based absorption of the twelve-tone system. In five brief movements, where the Larghetto vests the greatest depth but the Adagio the greatest intensity of expression, this finely conceived work is played with a perceptive awareness of the needs for formal balance and emotive freedom. 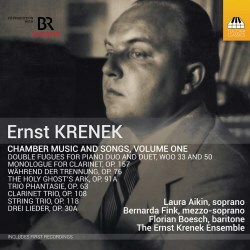 For a stripped-back example of Krenek’s instrumental control try the Monologue for Clarinet which lasts five or so minutes and sports a compellingly compact Larghetto and a witty Allegretto. The three songs, Op.30a for mezzo, clarinet and string quartet go back to 1924, a rather death-drenched opus that combines gauzy dreamlike moments with overtly expressionist elements. A brief Während der Trennung is for mezzo, baritone and piano and one of the most unashamedly ardent pieces in the disc though it seems, once again, that the composer didn’t think too highly of it. One of Krenek’s most obvious gifts is his ability to employ little melodic fragments in a way that seems and feels cohesive and naturally conceived. That’s very clear in The Holy Ghost’s Ark of 1941, a setting of one of John Donne’s sermons. The very specific employment of mezzo voice, oboe, clarinet, viola and cello ensures that the tone is predominantly is the ‘middle range’ from which deviations, especially from the wind instruments, invariably reinforce a textual point. Bernarda Fink is customarily excellent in this four-minute setting. This is a co-production with BR Klassik and was recorded by Bavarian Radio. From the scrupulous booklet notes, excellent recording quality and, hardly least, the penetrating and astute performances, this is a thoroughly persuasive and well-rounded disc.